Long time no post! I’ve been very busy at work, but have been chipping away at this puzzle game occasionally. 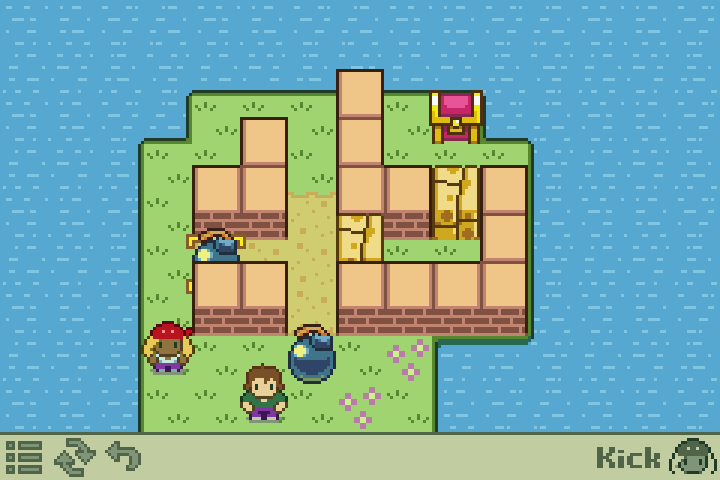 It doesn’t really have a name yet – it’s just called Puzzle Island for now. It’s a mouse-based puzzler where you just click to issue orders (in the case of this screenshot, click the bomb to kick it!). 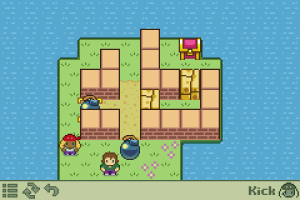 The commands are basically Kick and Move, with the eventual goal of opening the treasure chest. It’s intended to be a pretty small and simple project. Trixie Treasure should still continue eventually, but I don’t really have time for such a big project at the moment! Looks awesome as always sir! Nice palette.